These Dixie cup popsicle recipes are going to have everyone smiling! From fruity blends to rich, chocolate decadence, these easy homemade pops will hit the spot. Let’s get started. Part of the fun (and terror) of teaching my daughter to respect herself and make healthy food choices is getting her into the kitchen. 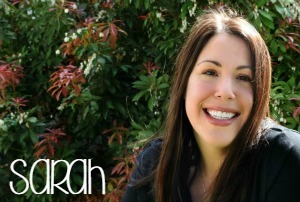 We started when she was 3-years-old, allowing her to pick ingredients for smoothies. Next, we tackled these quick Dixie cup popsicles, and now she’s graduated to the spice cabinet. Our only rule: you must taste any of your kitchen experiments. She’s had some winners. 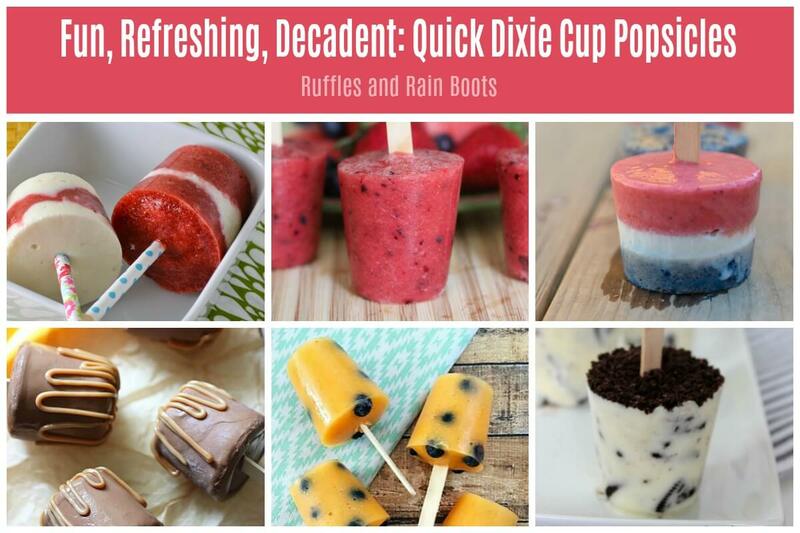 But these Dixie cup popsicle recipes are tried, tested, and kid-approved! 5-Minute Strawberry Kiwi Dixie Cup Popsicles – Ruffles and Rain Boots – These are one of the healthiest popsicles you can give little ones. The best part is they really only take 5-minutes to assemble. Fresh Fruit & Sweet Cream Popsicles – A Night Owl Blog – Blueberries, strawberries, and sweet cream (the quick-and-easy version) make a statement with this patriotic pop. Watermelon Berry Dixie Cup Popsicles – Food Fun Family – This is brilliant. A kid-friendly fruit salad turned into a Dixie cup popsicle recipe. Strawberry Orange & Banana Dixie Cup Frozen Ice Pops – Masshole Mommy – And just like that, she had me with citrus. What can I say, I’m an easy gal to please. Homemade Frozen Yogurt Dixie Cup Pops – Temecula Blogs – There is a secret ingredient and I’m in love. Colorful, healthy, and with a teensy-weensy crunch – I’m in popsicle heaven. Blueberry Peach Popsicles – Dancing through the Rain – Only. Two. Ingredients. 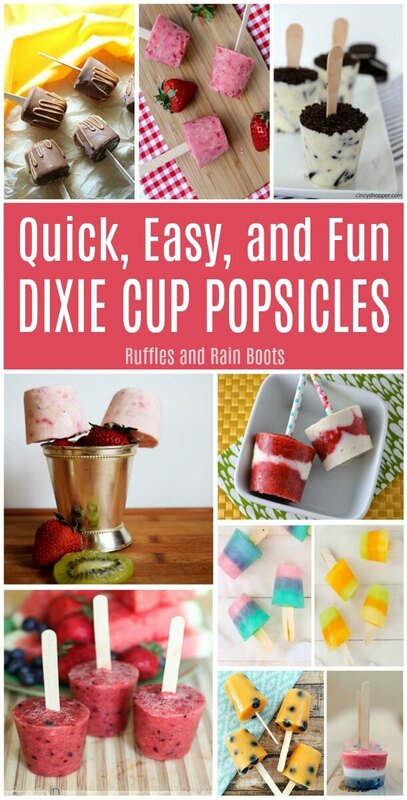 There is literally no one – not even me – who can mess up this easy Dixie cup popsicle recipe. Easy Striped Dixie Cup Popsicles – A Helicopter Mom – If they’re a fan of Kool-Aid, these striped popsicles will wow! the little ones. Easy & Fun Multicolored Striped Dixie Cup Popsicles – Mom Endeavors – She shows you how easy it is to make popsicles if you have juice in the house. Caramel Fudge Dixie Cup Pops – Tastes of Lizzy T – There’s no processed junk in these rich fudge pop. Just sweet goodness! Easy Oreo Pudding Pops – Cincy Shopper – Jen uses pudding as a starter to these crowd-pleasing Oreo pops. 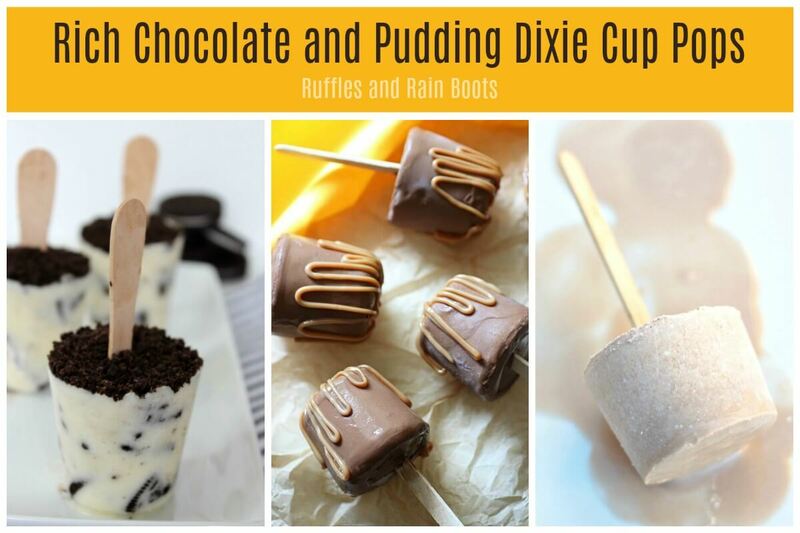 Candy Bar Dixie Cup Popsicles – Fantastic Fun and Learning – I’m going to keep this in mind for just after Halloween when we’re swimming in fun-sized candy bars. Way to go, mom – this one is smart! Homemade Strawberry Cheesecake Popsicles – Hot Eats and Cool Reads – Good gravy, I’m going to make these just for me. Cheesecake. Popsicles. Wonders never cease. Strawberry Jello Pudding Pops – Everyday Savvy – These are decadence with a shortcut. Pudding mix is her secret ingredient in these pops for strawberry lovers. 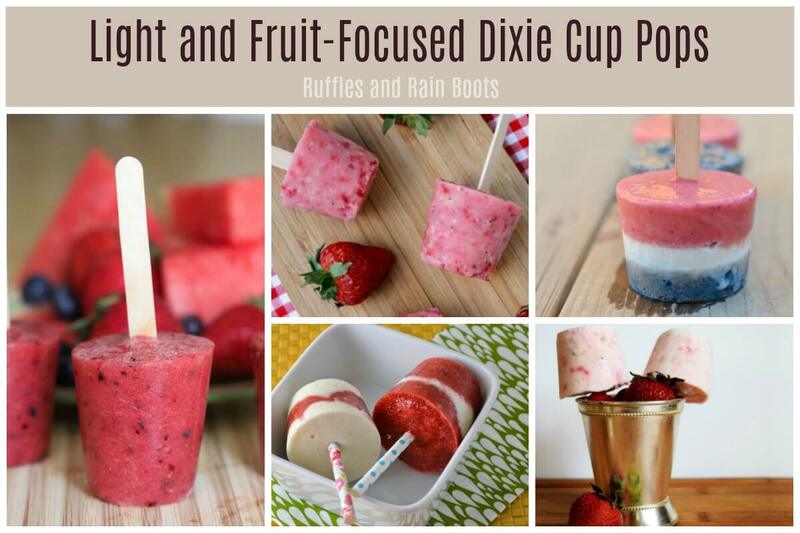 Which of these tasty Dixie cup popsicle recipes will you make first? It’s no contest for me: those cheesecake pops are happening.